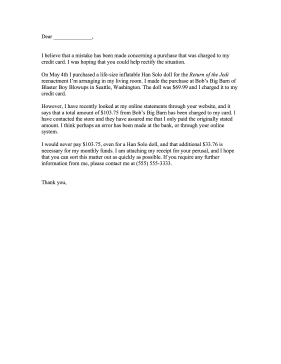 Banks and sellers can be the recipients of this credit card complaint letter for a double charge. I believe that a mistake has been made concerning a purchase that was charged to my credit card. I was hoping that you could help rectify the situation. On May 4th I purchased a life-size inflatable Han Solo doll for the Return of the Jedi reenactment I'm arranging in my living room. I made the purchase at Bob's Big Barn of Blaster Boy Blowups in Seattle, Washington. The doll was $69.99 and I charged it to my credit card. However, I have recently looked at my online statements through your website, and it says that a total amount of $103.75 from Bob's Big Barn has been charged to my card. I have contacted the store and they have assured me that I only paid the originally stated amount. I think perhaps an error has been made at the bank, or through your online system. I would never pay $103.75, even for a Han Solo doll, and that additional $33.76 is necessary for my monthly funds. I am attaching my receipt for your perusal, and I hope that you can sort this matter out as quickly as possible. If you require any further information from me, please contact me at (555) 555-3333.